The starting gong is sounded. Sharad’s staccato mumbling drones on in the background “1-2-3-4-5-6-7-8-9-10-1-2-3-4-5-6-7-8-9-10-1-2…” Sitting on my haunches, I feel my heart start to thump - slowly at first, and pounding soon after. My camera’s cross-hair aligned perfectly in front of me, my hand subconsciously fires shots in rapid succession. The commentator is narrating second-by-second happenings at a pitch which is getting higher by the minute, and may soon be heard only by canines. My brain sends me urgent signals to get up and run, but, my legs remain rooted. Sharad’s mumbling has reached a furious crescendo as he yells “Oh, come on! 1-2-3-4-5-6-7-8-9…faster! !” Through the viewfinder, I can see the hitherto dot-like man and bullocks run towards me, growing larger by the second, until I can see details of the bullocks’ ornaments. Sweat pouring down my forehead in rivulets and my palms sweaty, my eyes widen - fear finally strikes. “About time,” thinks my brain, jostling my legs into action. I spring up like a gazelle – fear endowing me with a surprising nimbleness - and run for dear life, without looking back. People around me are running too, in all directions. We hear thunderous applause and much screaming. I stop, look back and wipe my face. The adrenaline rush makes me return to my spot; I sit on my haunches yet again. Sharad’s hand fiercely grips the timer, ready to press the button yet again. We both squint at the horizon, in eager anticipation of the next run. 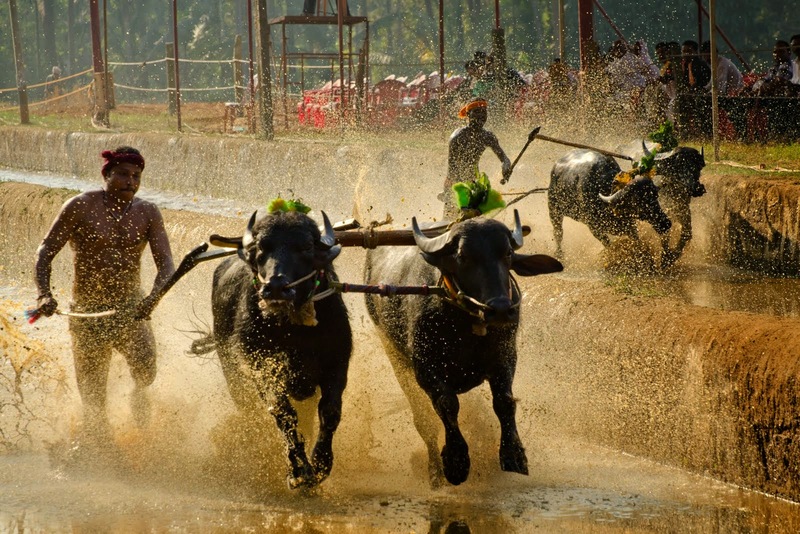 I was witnessing the Kambala - a race run by bullocks with their runners, a sport born out of seasonal farming schedules - with mixed feelings. The animal rights proponent in me told me I should be shunning it. 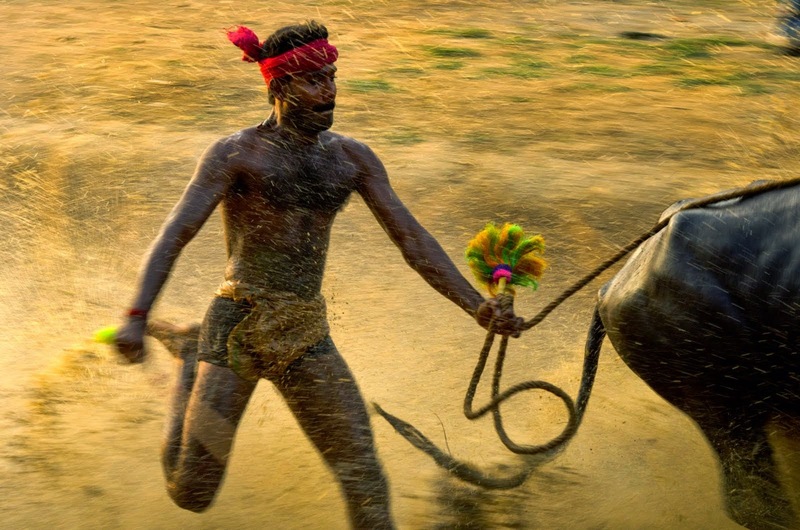 The culture enthusiast in me was piqued by the rituals and the sheer muscle-power involved. Eventually, not wanting an experience coloured by judgements, as it often happens to a person from an alien social context, my first avatar was vetoed out. Southern coastal Karnataka, also known as Tulu nadu locally, is predominantly a fishing and farming belt – growing paddy, to be precise. Paddy is harvested October onwards, with sowing beginning from March, leaving fields cyclically bare between November and March, when farmers would take a break from their hectic schedules, often passing time by running their bullocks in the slushy fields. Why wait for the farming season to pause? Even at the end of a long, tiring day, they would sprint home together, in anticipation of much-needed rest. A related belief is that the bullocks were made to run in their fields to thank the gods for keeping them in good health, and hence, capable of running. 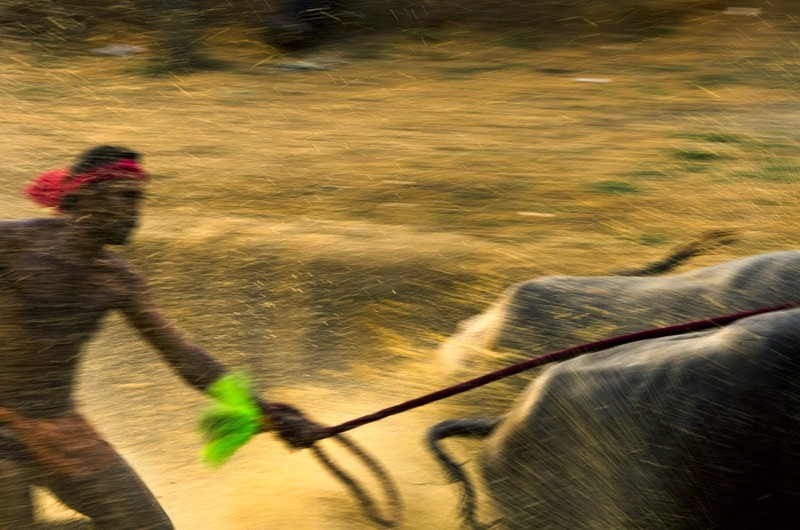 Yet another theory is that bullock racing evolved as a royal pastime, many centuries ago. 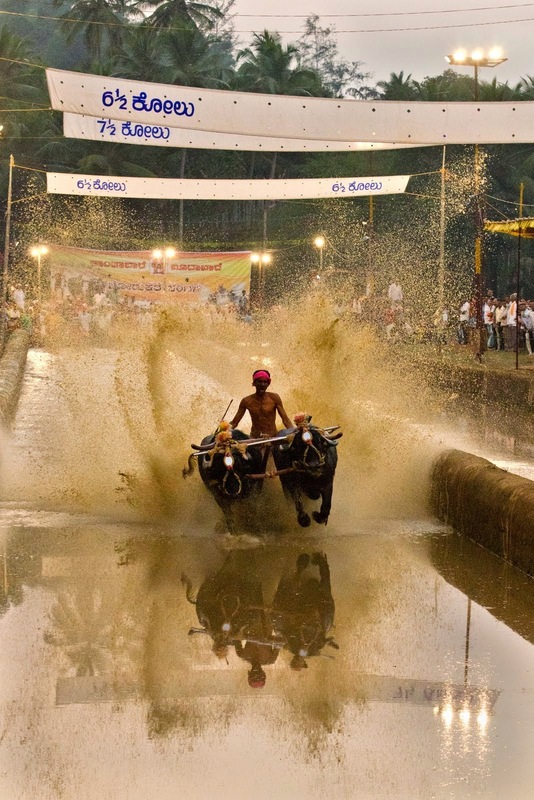 Whatever the origin, in its current avatar, Kambala also doubles up as a competitive sport. 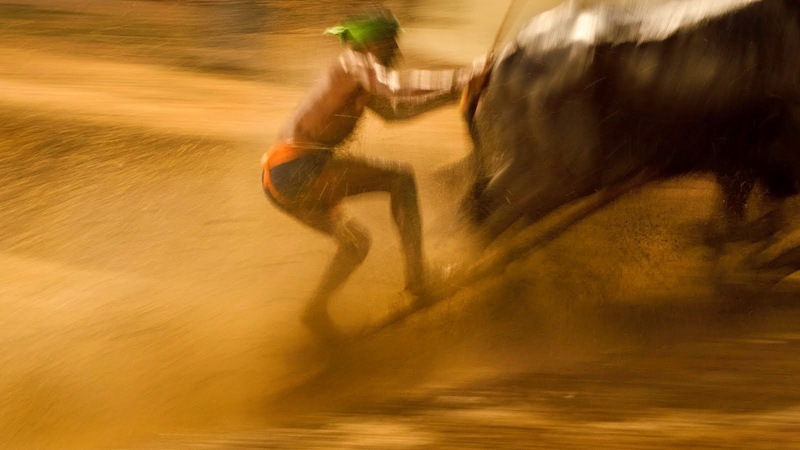 There are various categories of races; to qualify, a bullock pair and their runner run together to aim for the fastest timing, or, two pairs with their runners compete against each other on parallel tracks. 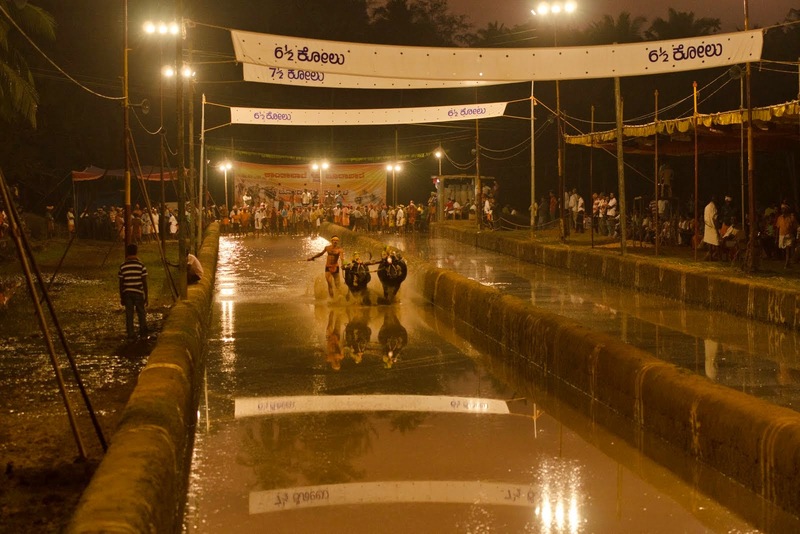 Because the races are held in paddy fields, often in tracks specifically built for the purpose, they are a long walk away from the nearest road. This path, donning a festive look with stalls of food and games, throws many a curious sight my way. Drums herald the arrival of teams from other villages, dressed in bright team T-shirts. Their lorries form impromptu dressing rooms for their bullocks, the stars of the show, being lovingly massaged and painstakingly ornamented, using mirrors, feathers or coloured rope. Nearby, a couple of men don the grease-paint, readying themselves for their dance later in the morning, which symbolises chasing evil away. 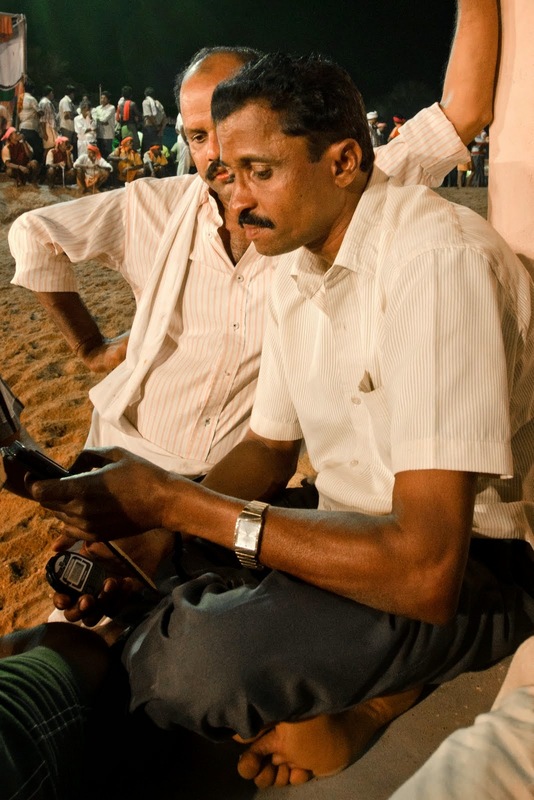 Families make a day of the festivities, but strangely, the women seem to disappear before they reach the Kambala track; with very few women spectators, a lot of the locals are inquisitive about my presence, with many going out of their way to make me comfortable. 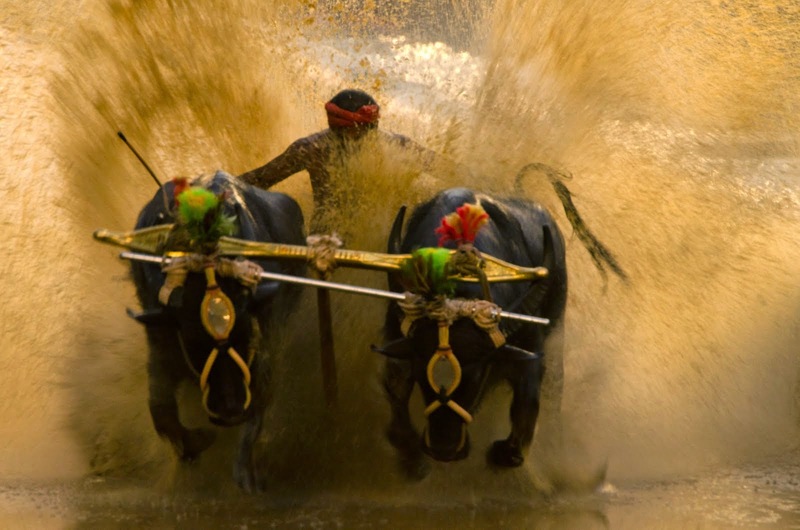 Though the Kambala isn’t as commercialised as you’d expect, it has definitely grown beyond the erstwhile humble prizes of fruits, coconuts or other farmed goods; cash and gold often change hands nowadays. Good runners are sought-after and lead a life of prestige; Sharad, who is timing his brother’s race, has a lot of hopes pinned on him. These runners, lithe, well-oiled, and sporting jealousy-inducing toned bodies, power their way through the slush, holding sway over the proceedings like nobody else. As I’m speaking to Sharad, a sudden, deafening trumpet behind me startles me out of my skin. 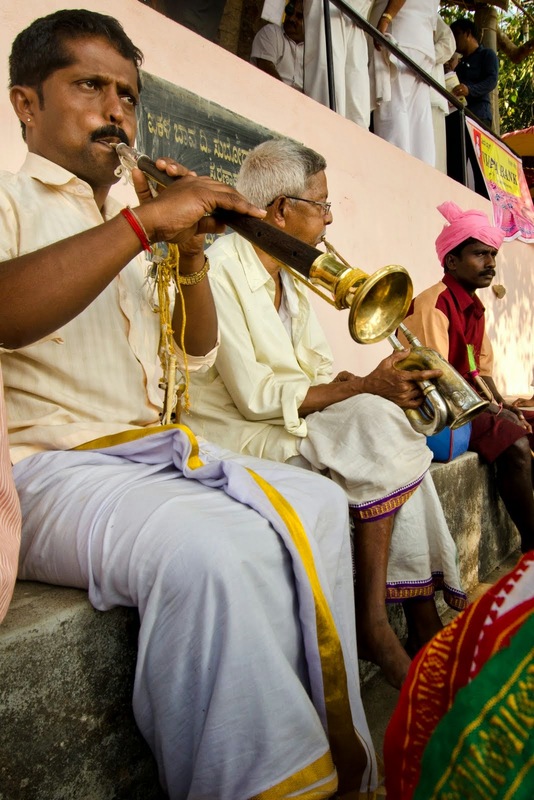 Amidst peals of laughter from the crowd, I turn around to photograph the offending musician, who offers me a split-second sheepish grin before solemnly launching into an upbeat melody accompanied by other assorted trumpets, bugles, and even a nadaswaram. 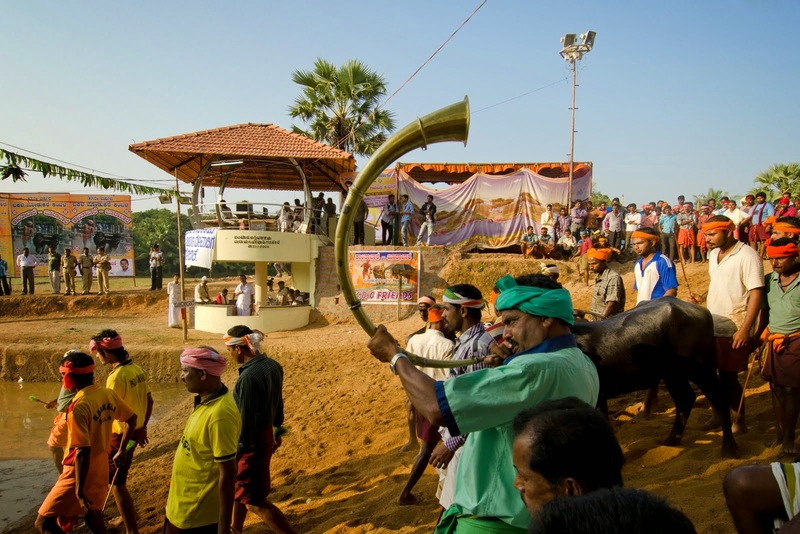 An intrinsic part of the Kambala, music entertains people during breaks. 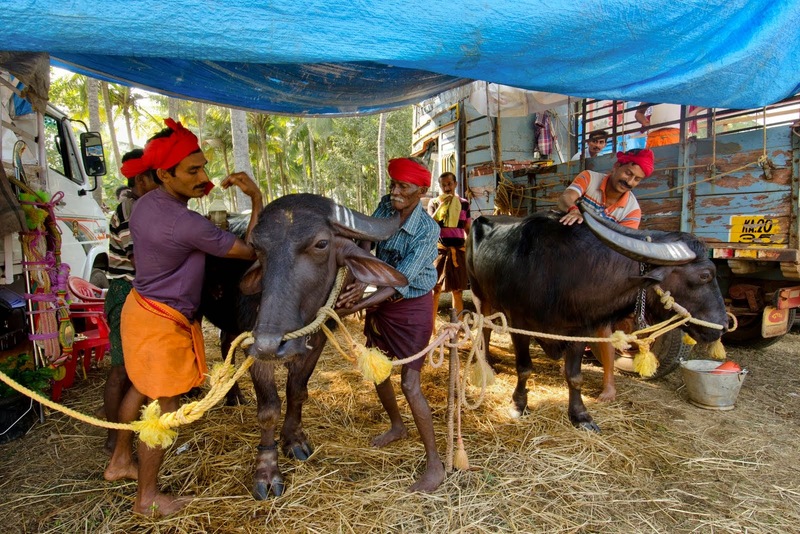 Breaks, because readying these massive water-buffalo, each weighing a few tonnes, for their run, is no mean feat. 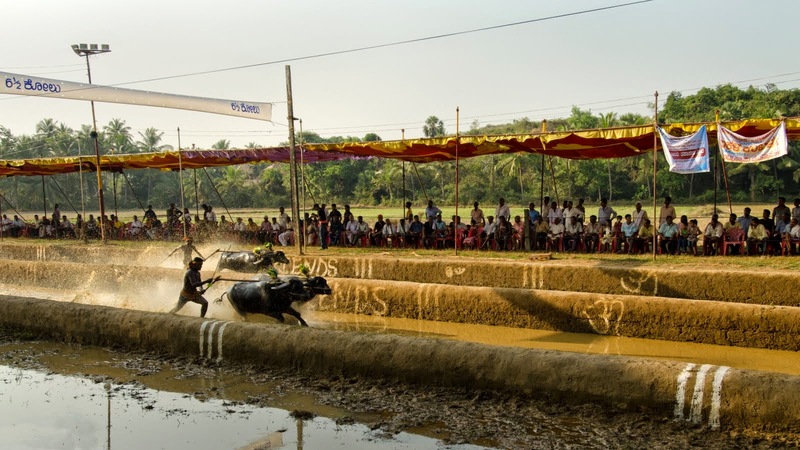 In these gaps of almost ten minutes between races, the bovines are led down the finishing slope towards the starting point, with much fanfare and music. Rapid-fire Tulu orchestrates the frenzied activities around the starting point: words of encouragement to teams readying for their run, soothing words to buffalo being cooled down post-race by a jet of water, and, the breathless words of last race’s runner, quickly discussing his performance with his team. Amidst this cacophony are seemingly grinning buffalo, as a referee intently takes stock of the bovines’ teeth - yellow, brown, black, sometimes, missing altogether – and makes a quick decision, categorising the animal as junior or senior. 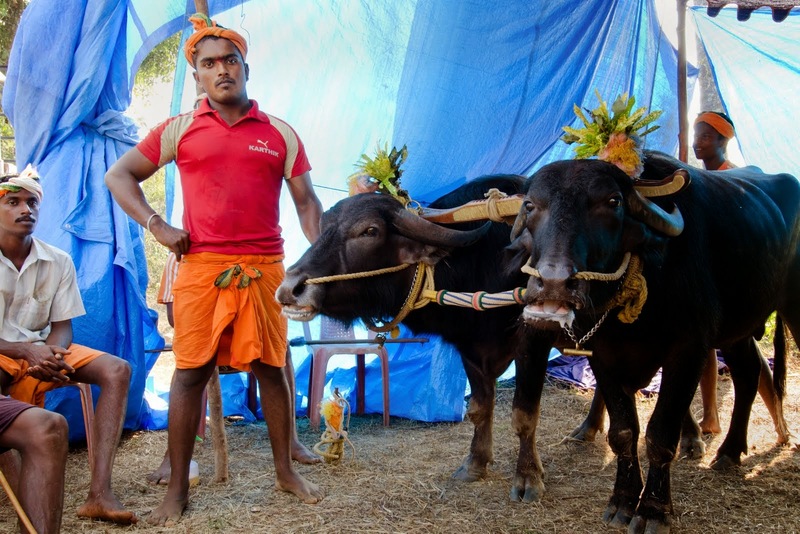 Only senior buffalo are considered privileged enough for certain races; a roar from the crowd tells me that one such category, where the runner balances himself on one leg, on a cube of wood tethered to the buffalo’s yoke, is about to begin. Even as I gape at the acrobatics involved, water gushes up as a jet through a hole in the block, spraying me in the bargain. I don’t really mind; the jet has touched one of the many banners tied across the track as height markers, declaring the team victorious. As the sun slides its way to the horizon, peeking occasionally between swaying palm fronds, unnaturally strong yellow floodlights are pressed into service to simulate daylight. Races continue well into the relaxed Saturday night. 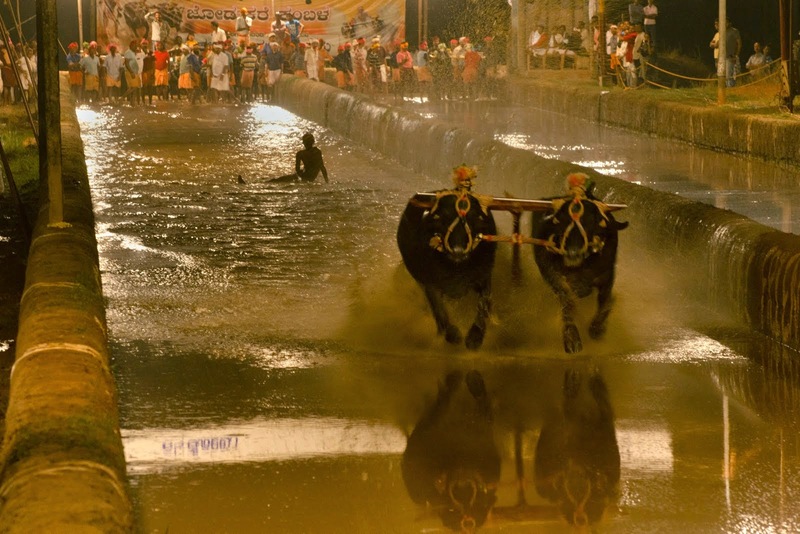 On Sunday afternoon, once the champions have been crowned, a weary crowd will head home, some jubilant, some dejected, but all having savoured the Kambala. The triumphant runner and his glittering trophy will probably be hoisted on the winning team’s shoulders, for a boisterous victory lap around the track. A few runners and buffalo owners will be a couple of lakhs richer. 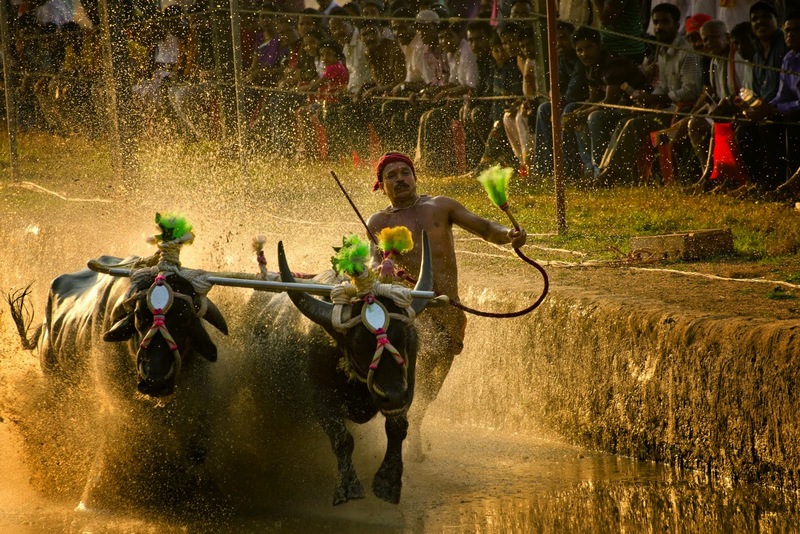 Yet, somewhere deep down, Kambala remains a village pastime. 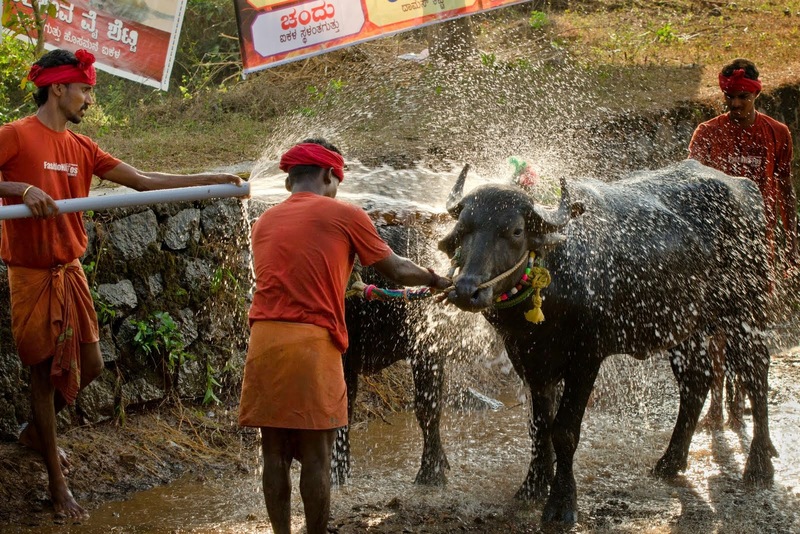 If you steer clear of the larger Kambalas, you can travel back in time – where the bond between the runner and his bullocks is palpable, where competitors also share camaraderie, where the entire village turns up decked in their festive best. I turn away from the glare of the evening floodlights, and see them there – three friends running into the setting sun, words unspoken, yet, in perfect sync; their emotions saying it all - a friendly slap on the back here, a joyful splash of water there, washing away the sweat from the day’s toil; the air echoing with their audible breathing and the heavy thudding of five pairs of legs; Kambala, in its primal form - nothing more than man and beast enjoying a run. Though animal welfare groups have raised their concerns over this sport, I feel there is a lot of culture involved and not just entertainment. Lovely read! Thank you, Niranjan. Yes, I too had mixed feelings. An enjoyable and entertaining read, with action packed pictures to accompany your write up! Each photograph a class by itself. Loved it. Congratulations, Raji. Very well written and documented .. congratulations Raji..
Shrutee, nice to hear from you! Thanks :)...glad you enjoyed reading it.